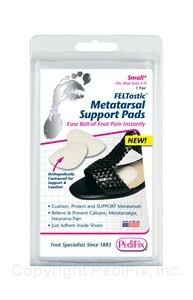 Soft, contoured, genuine wool felt pads adhere to the insides of shoes to cushion, protect and support metatarsals. Unlike flat pads, their unique orthopedic shape actually helps improve the position of foot structures to relieve the cause of forefoot problems, not just the symptoms, like calluses and pain — sometimes described as “like walking on a pebble”. Felt conforms to the wearer’s feet for customized relief. 1 pair.